When you're about to make a trip to an exotic place that you’ve never been to before, your mind is spellbound and lays out a scenario that's a little bit like a fairytale. Then when you arrive at that place, the mind quickly encapsulates it and creates an indelible imprint, a roadmap made up of familiar associations from your own past. That’s a little bit what the experience of seeing Kathryn Bigelow’s Zero Dark Thirty is like. Hannah Arendt famously coined the term the “banality of evil,” in her classic Eichmann in Jerusalem: A Report on the Banality of Evil. Zero Dark Thirty is the banality of good and evil. One can’t help comparing Zero Dark Thirty to classics of political cinema like Z, The Conformist or the film whose cinema verite style it most imitates, The Battle of Algiers, but Zero Dark Thirty falls neither into the categories of fiction like The Conformist, nor cinema verite (which uses non actors to enhance reality) like Battle of Algiers nor obviously, on the other end of the spectrum, documentary--though both its heroine, Maya’s (Jessica Chastain), unshakeable faith in her mission does recall the role Jodie Foster played in Contact, while curiously the analysis of photos recalls another cinema classic about discovering a murderer in a haystack, Antonioni’s Blow-Up. Still there are two looming issues at the center of the controversy around the film: the morality of using torture and its efficacy. A third issue relates to the whether the filmmakers did enough due diligence in description of techniques like waterboarding. Was it a cup of water or a jug of water that was used? To recall another film classic, Zero Dark Thirty is Dirty Harry on the stage of world history. When does the punishment fit the crime? When do the means justify the ends? Osama Bin Laden was killed and the order came right from the top. But are we ever justified in abrogating human rights? 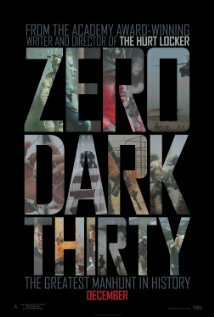 While Zero Dark Thirty isn’t journalism, it’s an odd hybrid of fact and fiction that succeeds in creating the feeling of what it might like to enter the world that we read about in the headlines. The figures are not larger than life. They do heroic things without seeming likes heroes and when the helicopters drop down into the compound to execute a piece of history, you feel like you're there and just like the soldiers on screen, just want to get out alive. U.S.A...United States of Assassins? There are no do-overs in a death sentence. Prisons are created to segregate predators from the society they would victimize; that is where bad guys belong. The use of torture by our government seems to be the failure of both morality and imagination; is it really possible that there are no other ways to accomplish our strategic ends than brutality and execution? Really? But what about the general’s plot to murder Hitler or the stringing up of Mussolini, the latter of which actually did remove a despot? At a certain point in the history of human struggle there seems to be a breakdown of all forms of order, even with safeguards like the Geneva Conventions. Then society reasserts itself and those who have murdered are either looked at as saviors or assassins themselves.